Mark Gabel, President of Safe And Sound, Inc. has donated a $1,200 gift basket to Friends of Foster Children. The basket will be auctioned at the annual "Boots & Boogie Bash" which hopes to raise money for this worthwhile and much needed charity. When asked why he supports FFC, Gabel said, "There are lots of charities that do amazing things. However, I have always believed that any organization that helps kids is invaluable. FFC fills that need by helping kids who desperately need it, not only do they need help financially, but they need guidance and support in life. That's what FFC provides, and I am so proud to be a part of their mission." FFC strives to achieve the best results possible to assist the more than 1,500 foster children who currently reside in Southwest Florida and need their support. FFC receives no federal or state funding but relies on generosity from the community to meet the educational and emotional needs of foster children. The current state of the economy has created even greater hardships for foster children and foster families. 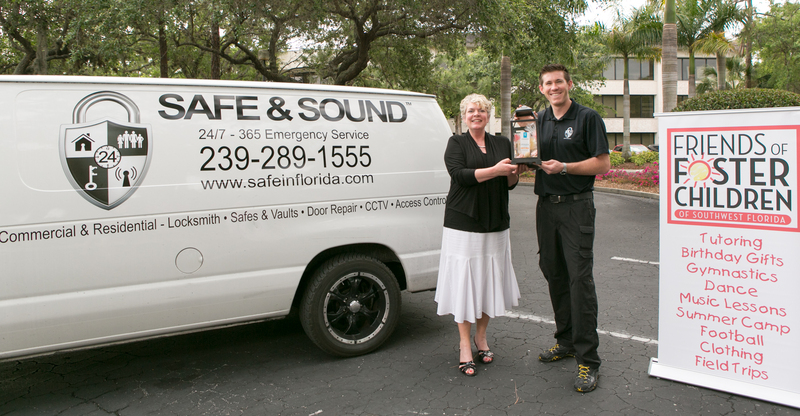 Safe And Sound, Inc. is a Naples based full service locksmith and security solutions company to the residential and commercial sector. The founder, Mark Gabel has lived in Naples for over 20 years and is a proud supporter of FFC since being introduced to the group by Jim Henderson of William C. Huff Moving & Storage.